I have been very busy with making bunny shuttles, and then I had a pleasant visit from my daughter and her children for 2 weeks a little unexpectedly early, but very fun time had by all. I decided to ask West Pine Creations for some help with some tatting that I wanted to get around too! She came through with flying colors look at what she has done with one of these! Because this is real shell it has a curve and slight uneven oval. I have seen very beautiful resin one for sell to practice on too. This is so wonderful and she did a fine job! I plan on putting pearls coming from the sides like this. Here she is in a different light! Thank you West Pine Creations, I am going to try going around one of the others, and I have and bought another cameo from ebay! Renulek Collar has captures my interest, the first row seemed very straight and the second put a slight gentle curve, the third round seemed to almost straighten it all back out! size 20 thread and 81 rings. I find I complete long repetitious rounds by marking it, going 10 spaces at a time! I was a test tatter for Margaret's new "Lacy Orchid Pendent"
I really had fun with different colors and beads! I found my self wanting to fidget with the petals but after completing a couple you learn to play with the petal placing when your flower is complete! Isn't it beautiful! While Shuttle Making I Was Sent This Beautiful Picture! Debra A. wanted to show me what she has been up to, and is allowing me to show of her work on my blog, this works out fine for me, sometimes viewing shuttle making can get boring. This is more tatting eye candy! 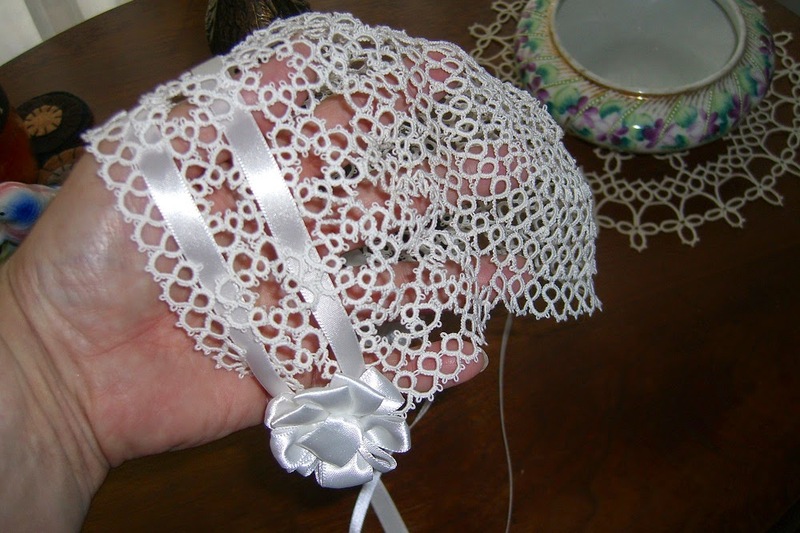 I always love a touch of ribbon with tatting and she did a great job! this grandbaby gonna look good! Before I got my little rabbits out the door, Husband said these do not pass inspection, so he went to work smoothing them out! Any one remember Lucy Ball and how she wanted an out door brick barbecue grill ? Need I say more? Actually I have been receiving more instruction too but the help is really nice! I did get quite far with these two since I am not thrilled about using the ball. This means fireworks and strawberries and grilling out and potato salad. corn on the cob :) to celebrate the independence. Don't have pictures of the rest of the items but this one is the strawberry! The pineapple is now a strawberry! Her pineapple patterns came a few years later, than the Cunningham in previous post, I wonder if she was inspired by her, they both are truly talented. This is how I hold the split ring in my hand when forming the other side, thread around 3 fingers, and and I slide the shuttle over and under the ring thread, palm facing me as I work. Yes I did finish Renulek's doily Yea! and started making little bunnies shuttles, I haven't done this in long time, I have made new chocolate ones and place hooks in the nose if wanted.